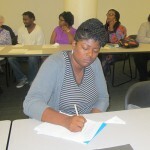 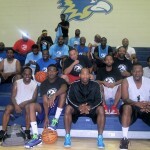 Local citizens and organizations are calling for justice in the shooting death of an unarmed teenager in Ferguson, Mo. A demonstration is planned for Friday at Red Arrow Park, where an African American man was shot to death by a police officer in April. 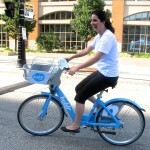 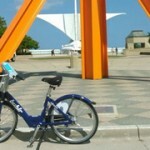 Reporter Raina Johnson takes a Bublr bike ride around Milwaukee. 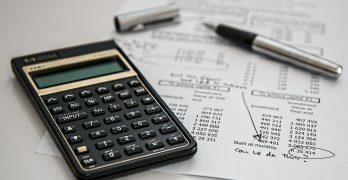 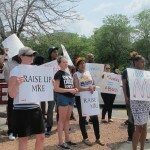 Low-wage workers rallied at a local McDonald’s in support of a recent opinion by the National Labor Relations Board general counsel that the company — not just franchisees — has control over workers’ wages. 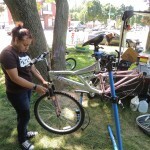 Mobile Bike Hub internship provides teens with a unique opportunity to learn bike repair and prepare for employment after high school. 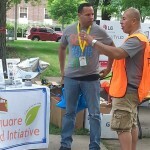 Clarke Square residents and volunteers helped clean up the neighborhood on the third annual Serve Your City Day.